The Rio Grande Valley will experience 80-degree weather before a strong cold front moves into the area Thursday afternoon, according to the National Weather Service in Brownsville. The front will bring breezy conditions and is expected to begin moving into the region at about noon. Expect rain and/or drizzle Thursday night into Saturday. 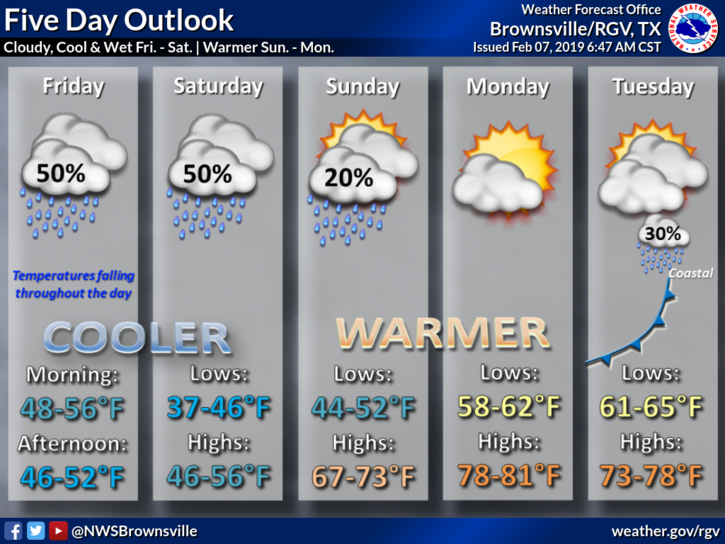 Before the cold front, however, McAllen is expected to reach 83 degrees and Brownsville will see a high of 81. The cold front will result in up to a 40-degree change in temperatures between Thursday and Friday afternoon. Lows on Friday will range from 48 to 56 degrees. Highs will be between 46 and 52 degrees. On Saturday, there is a possibility of some areas of the Valley experiencing lows in the 30s. Highs will range between 46 and 56 degrees. There is a 50 percent chance of rain on both days. The Valley will begin to warm again on Sunday with highs in the 60s and 70s.